Jeff Sobotka, Vice President with the Arizona Commerce Authority, has been appointed the State Broadband Director. This is an important accomplishment for the state. You will have the opportunity to meet Jeff and learn about his position, plans etc. He plans to provide a brief presentation and then have have a dialog and Q & A with attendees. I know he is looking for input and suggestions from people like you. Participant Discussions/ Engagement: What kind of projects are you working on? What kind of partnerships do you need? What resources are you looking for? How can the Network help you? 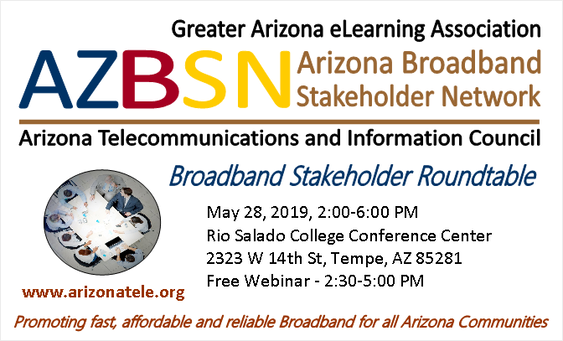 Several Ignite Presentations featuring Arizona community broadband initiatives (Projects​TBD): Speakers will have no more than 5 minutes, and must use 20 slides with each slide advancing automatically after 15 seconds, forcing them to get the point, fast. For most speakers having slides that automate, forces them to be far more concise and thoughtful than they would in any other format. The Roundtable will conclude with a reception, networking and a sponsor/partner/project showcase. So stick around after the Roundtable for the reception and networking, networking and more networking. You will get an opportunity to connect with colleagues, visit with our sponsors, our government, education and community partner organizations and; Arizona Project Leaders. Yep, you will get to make friends and influence people and identify potential providers or strategic partners for your initiatives. Oh yeah, and great eats.